The Sand-Factory is specialised in workshops. These workshops run from teambuilding, company party's till bachelor party's and family day's. From a first experience with sand sculptures up to a professional workshop. The Sand-Factory.com has the didactic resources, the materials and a strong social team to give you a workshop. From a nice day in the sand to a serious course, where proportion, anatomy, physicals proportions and/or architectonical rules can come up for discussion. This workshop contains a brief explanation about the creation of sand sculptures, the use of forms and the used tools. The participants will start immediately. First the participants will compact a block of sand in the forms. Secondly they will carve there sculpture out this block of sand. This workshop has a informal character. 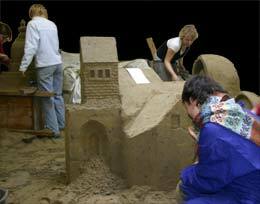 This workshop has a detailed explanation about the creation of sand sculptures, the use of forms and the used tools. During the workshop we will give more attention to the design, composition, the techniques and the finishing of the sculpture. This workshop has a educational character. Interested? Contact us or fill out our form.